Sightseeing is hard work, not just physically but mentally, especially if you're wandering around ruins. It's difficult to picture how a place used to look, even with a guidebook, history notes and a good imagination. Now, though, the hi-tech wizards of the 21st century have created a gateway for time travel. With a few taps, your iPhone or iPad becomes a window on to the world around you – as it was a millennium ago. Turn, and the view turns with you. Suddenly an empty field is a noisy marketplace; a deserted lake shore is full of busy craftsmen plying their trades; a lone wall becomes a soaring cathedral. 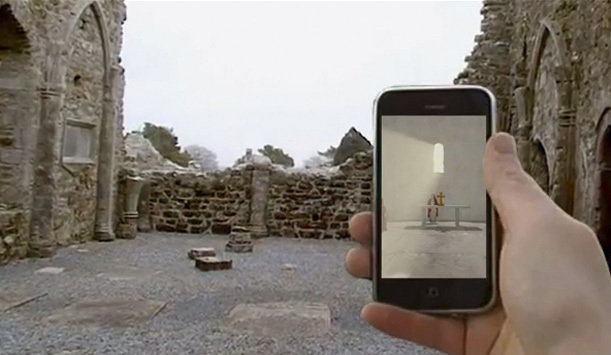 The app Clonmacnoise was created by Irish 3D-technology firm RealSim Games. It shows users how the monastic settlement of the same name in County Offaly would have looked 1,000 years ago. 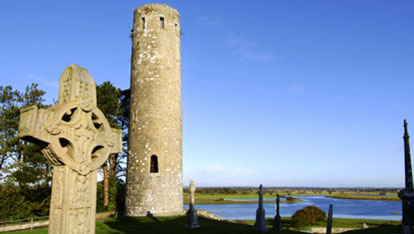 When RealSim Games chose where to start their technical time travelling, they chose Clonmacnoise for good reason: Lonely Planet calls the site "one of Ireland's most important ancient monastic cities, with numerous early churches, high crosses, round towers and graves." Gavin Duffy, Managing Director of RealSim Games, goes further, "It's a hugely important and underappreciated site, not just in Irish history but in early European history." So how did Gavin end up remaking such an epic ancient world? After studying geophysics, he started RealSim Games, creating spatially accurate projections of housing developments for planners. To achieve enough detail in its computer models, the company used technology developed for video games. "Games feature complex fantasy worlds," explains Gavin. "Game designers had already written the software to recreate perspective and light – we just applied it to the real world." Fate and timing then coincided to introduce Gavin to a rather more ancient architectural world. The Republic of Ireland's national broadcaster RTÉ happened to making a documentary, The Secrets of the Stones, about Clonmacnoise, and Gavin got a call asking him to create a simulation of the settlement. "It was a challenge because not much of the city remains. The ecclesiastical buildings and the high crosses have survived because they're stone, but the houses were wood, so we just had archaeological finds to work from," says Gavin. However, the team, which included an archaeologist, a 3D modeller, a graphic designer and a programmer, realised they were onto something special. Just one more ingredient was needed to make a virtual time machine – and a world first: GPS technology. With that in the mix, the team could create an app that moves with the user, superimposing the past onto the present. "Plenty of tourist sites use computer simulations," says Gavin, "but they are pre-rendered, 2D versions. They can't respond to your movement; they can't see what you're seeing when you're seeing it." The potential is huge, and Gavin's excitement is contagious. "Imagine what you could do with a city! You could walk down the street and see the shops that stood there 400 years ago." However, ancient worlds aren't built in a day. “Our next app is medieval Galway," says Gavin but, as ever, the devil is in the detail. "At the moment we're trying to work out the texture for the doors. We'll get there, but it has to be right." Trace the history of the Vikings in Ireland, from their first settlements to their lasting impact on our landscape.